Nemad Maritime Safety Service Center Oostende staat nu ook als erkende service provider in de lijst bij FOD Mobiliteit en vervoer! 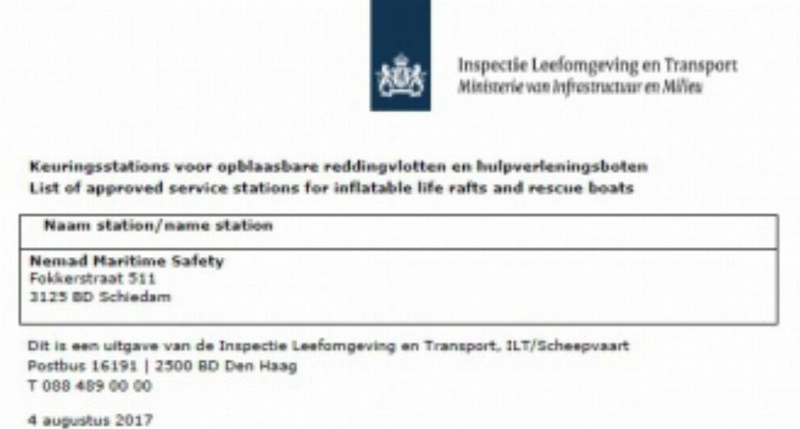 On August 4th the Dutch ministry of Environment and Transport, ILT/Shipping publiced the official approval of Nemad Maritime Safety as Solas service station for inflattable life rafts and rescue boats. Important Update: EEBD Replacement According to SOLAS ammendment regulations II-2/13.3.4 and 13.4.3 that were enforced in 2002, all vessels are equiped with Emergency Escape Breathing Devices (EEBDs). Units installed in 2002 must be replaced as their 15-year lifespan draws to a close at 2017. In its endeavor to continuously improve the quality of its services, Nemad Group has expanded the scope of its ISO 9001 and ISO 14001 certification with the activities of the Nemad Divequipment / Nemad Maritime Safety business. On April 11th, Lloyd's Register Quality Assurance has audited the activities of Nemad Divequipment and Nemad Maritime Safety. Hereby, the activities of the service station of Nemad Maritime Safety at the Fokkerstraat 513 have been audited in preparation for the approval by the Dutch Shipping Inspectorate as a Solas service station. The positive outcome of the audit has led to the extension of the scope of the ongoing ISO certifications of Nemad Group and its Companies, Nemad fasteners, Nemad Technical Wholesale, Nemad Divequipment and Nemad Maritime Safety.